I honestly get so sick of the Nordstrom Anniversary sale because of all the posts popping up on Instagram everyday. I really think some of the stuff is a definite miss but last year I bought a few pieces that I wore constantly. So this year I decided to give it a go again. I only listed pieces in this post that I tried for myself and kept or would have kept. The sale ends on the 5th, and the prices go back up on the 6th, so this is a perfect rainy weekend project. I really love the clothes that I bought and nothing listed below will break the bank!!!! Happy Shopping!!! I bought this shirt and have worn it a bunch of times with white jeans but It would look great with blue jeans or leather pants. I bought this dress in a few of the color ways and it is incredible. I plan on wearing this with leather pants all fall!!! The sleeves are amazing!!! 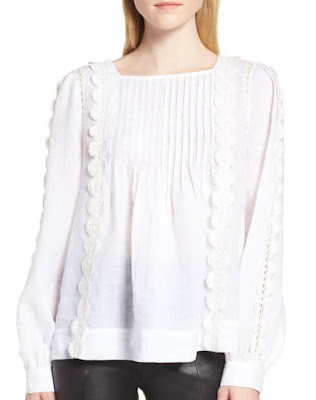 This sweater is channeling Valentino to me...I plan on wearing it a ton this fall/winter. The black are great too!!! !